Madamigella, come vi chiamerem stasera? Dov'è dunque i biglietto di Zatima? Giusto cielo! che feci in tal giorno? "Una volta c'era un principe..."
. 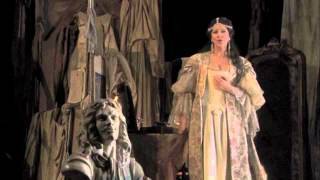 . . [Angela Gheorghiu] impresses as the opera star heroine. And the supporting cast is outstanding. Jonas Kaufmann is perfect as Maurizio, Olga Borodina a conniving Princess, and Alessandre Corbslli's Michonnett could not be bettered. David McVicar's direction, Charles Edwards' simple sets and Brigitte Reiffenstuel's costumes are excellent. This is a superb production in every way with the camera almost always in the right place, excellent audio, and plenty of tracks for easy access.
. . . Mark Elder leads the orchestra and chorus in a lavish performance . . . She certainly has the temperament to play Adriana, who can present herself as humble and sweet but, in a scene where she takes the stage, is nothing if not intense . . . this recording provides a reminder of how secure and uniquely attractive her singing can be. Her soprano glides effortlessly, its top still silvery, over the oft-excerpted arias "Io son l'umile ancella" and "Poveri fiori." There's a real core even in much of her soft singing, and the recording flatters her lower register. As Maurizio, Jonas Kaufmann has the ideal chiaroscuro sound to portray both poet and warrior. It's great to hear his robust tenor at full force . . . Olga Borodina makes for an imperious princess . . . Alessandro Corbelli employs luster and dignity.
. . . [this production], featuring a starry cast and sensitive conducting by Mark Eider, makes the best possible case for this [opera] . . . Certainly any Adriana stands or falls on its prima donna . . . The role of the great French tragedienne is one Angela Gheorghiu was born to play . . . [every] weapon in the verismo arsenal is at her disposal -- vibrant temperament, sharp dramatic instincts, dear diction and throbbing, urgent tone that can be hardened to reflect the emotions of the moment. Adriana, of course, also requires lightness and pure vocal beauty for her two major arias, which Gheorghiu has in abundance. And that great test of a diva's declamatory skill, the "Phedre" monologue in Act III, is thrilling here. Gheorghiu is partnered by three singers who also qualify as true stage animals. Jonas Kaufmann is everything one could want as Maurizio: dashingly virile of presence and timbre, he tirelessly pours out passionate, molten sound. He and Gheorghiu have wonderful chemistry in their love scenes. Alessandro Corbelli, a singing actor who rarely lets the audience down, is subtle and touching . . . As the Princesse de Bouillon, Olga Borodina is one scary pit bull, commanding the stage with her imposing presence and cannonball voice. Her fiery confrontations with Gheorghiu in Acts II and III are more than evenly matched . . . One has the sense of a unit production with none of the budgetary economies that often implies. There is plenty of appropriate lavishness on view here, not only in the sets but in Brigitte Reiffenstuel's beautiful eighteenth-century costumes. The entire production is a cohesive whole to which McVicar adds some insightful flourishes . . .
Cilea's "Adriana Lecouvreur" demands not only a lead soprano who can still bring a first-class voice to bear, but also one who intrinsically understands a prima diva's presence and demeanor. In soprano Angela Gheorghiu the Royal Opera House is suitably twice blessed in this compelling production, with the bonus all-star casting of Jonas Kaufmann, Olga Borodina, and Alessandro Corbelli . . . it is very well done.
. . . [Angela Gheorghiu]: Kunstfertigkeit und Natürlichkeit, ehrliche Einfalt und wirkungsbewusstes Raffinement, Pose und Instinkt sind hier untrennbar. Jonas Kaufmann ist als Maurizio mit Dreitagebart ein Tenortraum mit feinen Piani und viriler Attacke. Mark Elder lässt das Orchester sanft glühen, nie zu laut werden und bürstet den instrumentalen Plüsch sorgsam frisch. Mit unfehlbarem Blick für Details und virtuoser Personenregie inszeniert David McVicar das Drama um Leben und Sterben der französischen Tragödin als Reflexion über das Verhältnis von Wahrheit und Fiktion, Schauspiel und Wirklichkeit . . . Als überzeugender Schauspieler verkörpert Jonas Kaufmann einen attraktiven, virilen Maurizio, der so verwegen wirkt, als käme er geradewegs aus einer Schlacht geritten . . . Als Sänger überzeugt er nicht nur mit virtuos eingesetztem Messa di voce, samtigen Piano-Effekten und dunkel schimmerndem Timbre, sondern gibt den jungendlichen Liebhaber auch mit betörender Italianità und der geforderten Dramatik . . . [Olga Borodina / Princesse de Bouillon]: Vokal überzeugt sie . . . durch ihr volltönendes Stimmfundament und imponierende Durchschlagskraft. Mit Sängern wie Alessandro Corbelli (Michonnet) und Bonaventura Bottone (Abbé) sind auch die Comprimarii hervorragend besetzt. Mark Elder dirigiert mit großem Sinn für die Schönheiten der Partitur, ihre delikaten Farben und Zwischenwerte. Endlich ist 'Adriana Lecouvreur' in einer szenisch wie musikalisch überzeugenden Produktion erhältlich. Auf diese DVD hat man lange gewartet. Les micros rendent, à ce titre, mieux justice à la délicatesse des nuance et des phrasés proposés par Mark Elder aux instrumentistes et aux chanteurs, toujours conduits avec une belle énergie . . . une direction d'acteurs convoquant ¿ dans une mine, une attitude, le reflet d'une paire de lunettes dans l'obscurité ou le froissé d'une chemise sur une épaule . . . Quelle sensualité au contraire dans les étreintes de ce couple, quelle tendre humanité dans le regard du vieux régisseur! . . . [Gheorghiu]: à l'intensité des élans dramatiques, répond une voix dont la légèreté serpente sur toute la tessiture, posant dans le grave ses accents enflammés et sur l'aigu sa clarté de lune, portant la phrase sur le souffle avec un contrôle absolu, des grands éclats à l'étirement d'un murmure qui fait courir des frissons dans le dos . . . [Kaufmann]: le beau ténor allemand s'y montre aussi passionnément investi qu'idéal de noblesse et d'énergie vocales conjuguées ¿ ah, ces piano qui gardent l'assise sombre du timbre! Le Michonnet drôle et touchant d'Alessandro Corbelli se hisse au niveau du couple par ses moyens de diseur, et les seconds rôles tiennent leur rang. Somptueuse et furieuse à la fois, la Princesse de Bouillon d'Olga Borodina réserve bien entendu des moments vocaux stupéfiants . . .
Adrienne, comme Tosca, est un rôle de diva: la soprano roumaine y trouve évidemment un emploi à sa mesure, suscitant la passion du Maurice éperdu de Kaufmann ou du Michonnet résigné de Corbelli . . . un spectacle très coloré, où le théâtre et la vie se confondent, comme pour l'héroine. La captation souligne les qualités d'une direction d'acteurs au cordeau.